A new interchange opened at Route 59 and I-88 opened on Monday in west suburban Naperville. The diverging diamond is the first of its kind in the Chicago area. 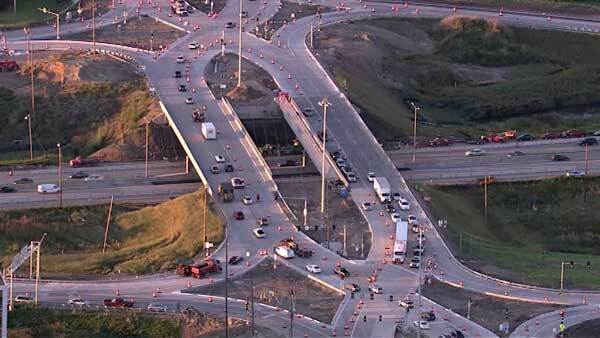 NAPERVILLE, Ill. (WLS) -- A new interchange opened at Route 59 and I-88 on Monday in west suburban Naperville. The diverging diamond is the first of its kind in the Chicago area. The goal of the unique design is to eliminate left turns across traffic and ease congestion. Illinois Tollway officials said in other parts of the country, the design helped cut the number of accidents in half. Officials said more than 40,000 drivers pass through the area near Route 59 and the Reagan Memorial Tollway each day.